A few months ago, we went to Florence and while Tuscany is not notoriously famous for its focaccia, I couldn’t help but falling in love with all the different focaccia I tried while I was there. They were often served like rectangular slices of pizza topped with tomato sauce, different cheeses and all sorts of grilled vegetables. They were definetely the perfect snack to eat on the go while sightseeing. But what struck me the most during our trip was how fluffy and pillowy the focaccia dough was. I had made focaccia at home in the past and tried different recipes but mine never came out so deliciously doughy. So as soon as we arrived home from our trip, my first challenge was to finally make a good focaccia. After a few trials, I learned that, the two main factors that will make your focaccia a success are 1. to make sure that you let the dough rise long enough in a nice bath of extra virgin olive oil and 2. to not over bake it. In a constant attempt to give a Moroccan twist to all my favourite foods, I naturally topped my focaccia with zaalouk (aka best aubergine salad/dip in the world). The end result is super delicious, exactly how I remembered it at Mercato centrale and Il Santo Bevitore in Florence. • Activate the dry yeast by adding ¼ teaspoon of sugar and a tablespoon of warm water in a small bowl. Stir with a fork and leave for 5 minutes to activate the dry yeast. • In a large mixing bowl, transfer in the flour, the rest of the sugar and salt. Add 3 tablespoons of olive oil, the yeast mixture and 160ml of warm water to the flour mixture. Combine the ingredients together to form a soft dough. The dough should feel a bit tacky but not too sticky. If your dough is too dry, progressively add tablespoons of warm water until you obtain the right consistency. If it’s too sticky, add in a bit more flour. • Lightly flour a worktop and knead the dough for 10 minutes until smooth and elastic. Press the dough with your finger, if it bounces back it means it is sufficiently kneaded. 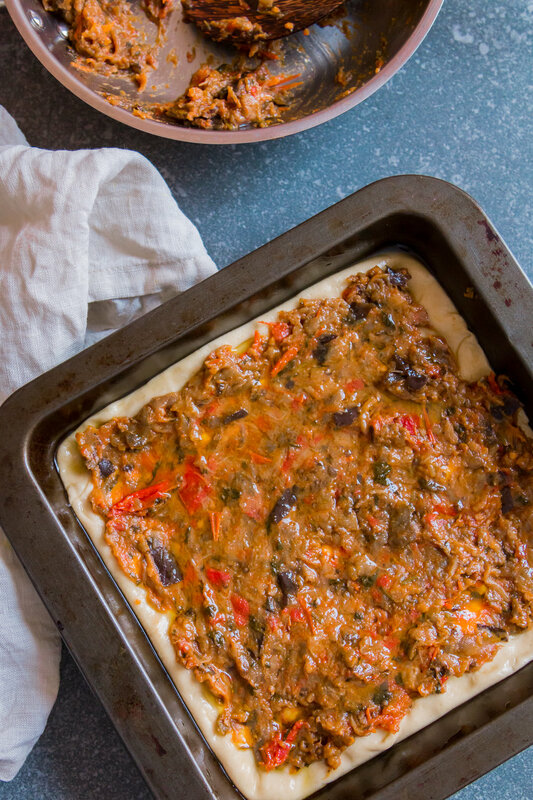 Pour 1 ½ tablespoon of olive oil in a 18cm square baking tin and place the dough inside the tin. Pour another 1 ½ tablespoon of olive oil over the dough and flip it a few times to make sure both sides are coated with olive oil. Cover with cling film and let the dough rest for 1 hour in a warm place until it almost doubles in size. • Use your hands to stretch the dough to fit the pan and use your fingers to dimple the dough. 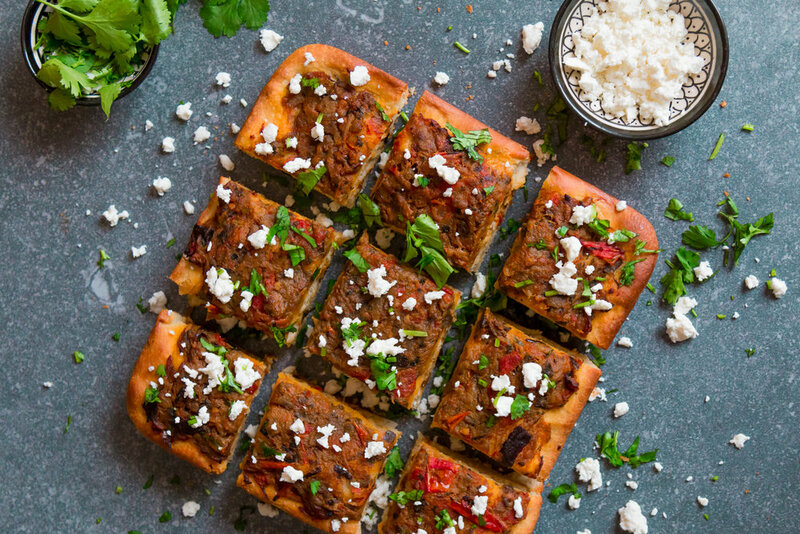 Top the dough with just enough zaalouk to cover its surface and drizzle the remaining tablespoon of olive oil over the zaalouk. Cover with cling film and let the dough rest again for 30 minutes in a warm place until it puffs up a little bit. 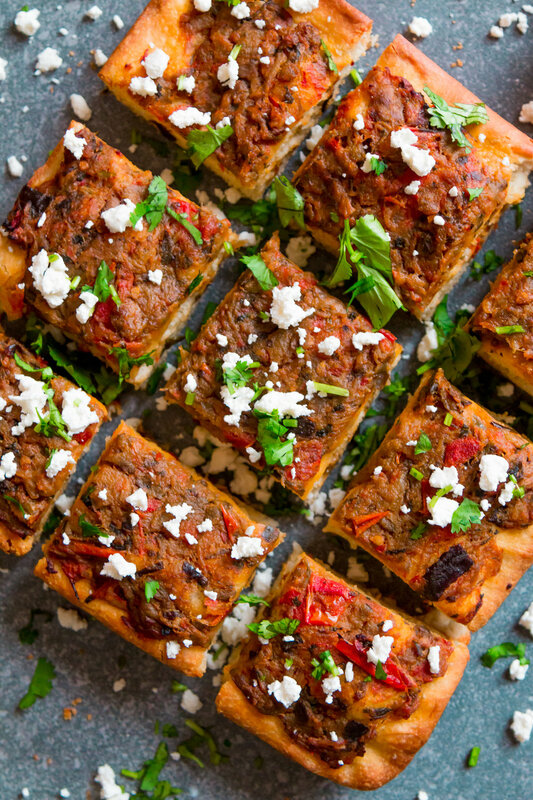 • Preheat the oven to 220 C / 420 F. Transfer in the warm oven and bake for 15 to 18 minutes until the sides of the focaccia are golden and a wooden cocktail stick inserted in the center comes out dry. Carefully remove the focaccia from the baking tin and leave to cool for 15 minutes. Garnish with the chopped coriander and crumbled feta before serving.